The Gundam series has now been around for just over three decades, and since 1985 there have been plenty of game tie-ins. Whether back in 1985 with the original Mobile Suit Gundam, or currently with the simulcasted Mobile Suit Gundam - Iron-Blooded Orphans, the concept has remained much the same through the years. Each series has seen events unfold around a youth finding or being given a powerful gigantic bipedal mechanical suit in order to fight for what they believe is right through some fairly poor odds and terrible situations. Related reading: For more Gundam action there is, of course, the Dynasty Warriors Gundam spinoff. Matt's review of one of the PlayStation 3 editions of that series. The Gundam Universe is both simple and complex at the same time. On the one hand there is the main series in which is titled the Universal Century, which contains the original and a fair number of sequels both big and small. To the side of this are various stand alone spin-offs from the popular After Colony (Gundam Wing) and Cosmic Era (Gundam SEED), to the more recent Advanced Generation (Gundam AGE) and Post Disaster (Iron-Blooded Orphans). 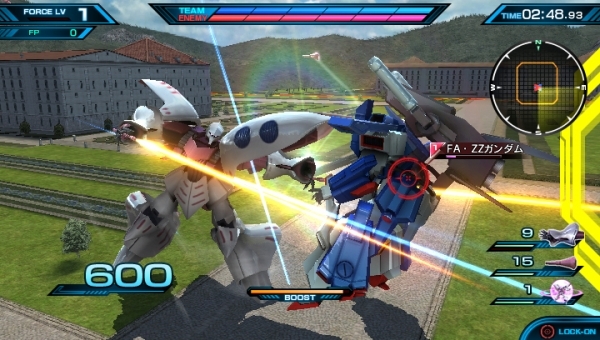 Mobile Suit Gundam: Extreme VS-Force puts you, the player, into the role of the protagonist who is a newly hatched AI. You have been designed with the goal to dive through the historical timelines in order to link together enough data in order to set humanity on the proper path to its salvation. Aided by what amounts to your two sisters, who are two other AIs from the same system, they will help your digital conscious merge with beings throughout this historical archive as you temporarily take their place during events of importance. 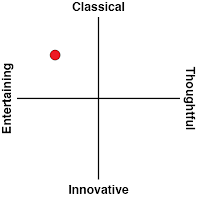 Following the Universal Century it soon becomes clear that mucking around with this data is causing anomalies opening up paths to other possibilities from events that occurred but not within this reality. With all of the setup in place, all the timelines, and all the characters with different reasons for fighting and clashing egos who would not have otherwise met up, Gundam: Extreme VS-Force has excellent gameplay but never really goes further than that which is a bit of a disappointment. 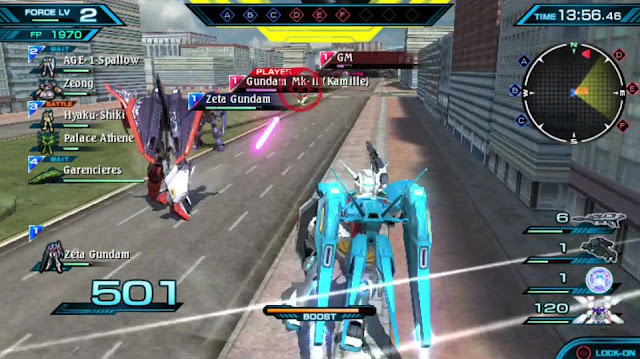 There are a variety of stages and goals both following the main Gundam timeline with some offshoot missions from the “enemy” point of view but minimal effort to give these characters personality within the game itself. This is even more disappointing when facing off against other pilots from different universes in order to acquire them for usage as these would have made excellent side stories. 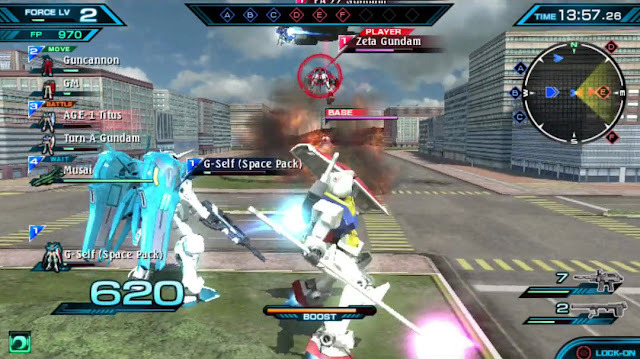 The gameplay itself is a solid experience that offers a variety of missions and character/mobile suit combinations. Making things interesting is the sheer number of suits on the field at times that, unlike what we see in Warriors titles, are more than simple cannon fodder and can readily turn your own suit into scrap metal. There can be restrictions on which suit you can take to the field but in general you’ve got a lot of variety to choose between. A key part of the game’s strategy is in forming the teams that you’ll be putting in to battle; every unit has a set value, and you’re not allowed to exceed a certain total cost for your group. Naturally the higher the cost, the more powerful the unit. So, while more expensive suits are worthwhile to have, sometimes having more is better in order to spread the incoming fire out across multiple units. After picking through the various units that can be sent out, the missions that you will embark on with them come in three general categories. The first are objective based missions that will see the capture of outposts or the destruction of the enemy’s warships. 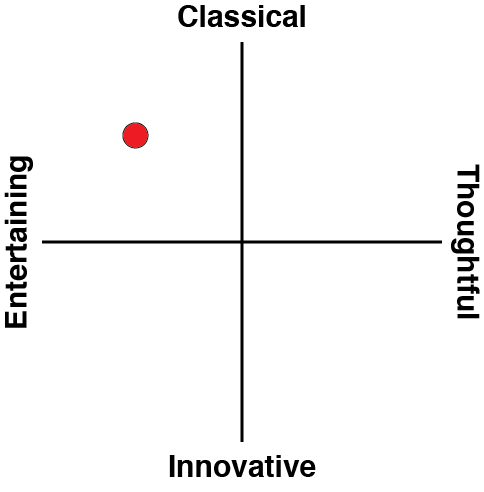 The second are a versus-style that pit equally balanced small groups against one another. Finally there are a different form on verses that you need to pay to unlock with the currency amassed during missions, but if completed they unlock new units to be used. Before going into any mission there is the option to boost the attack, defence, or mobility attributes of your unit by fifty per cent. These cost a significant amount but are sometimes required, thanks to some poor difficulty balancing. Even if it seems like you have cash left over after a completed mission and nothing to really spend it on, it doesn’t take long before some of those missions to earn new units cost enormous amounts to unlock. Regardless of your choices, there’s always more money to obtain by doing other missions in the meantime. 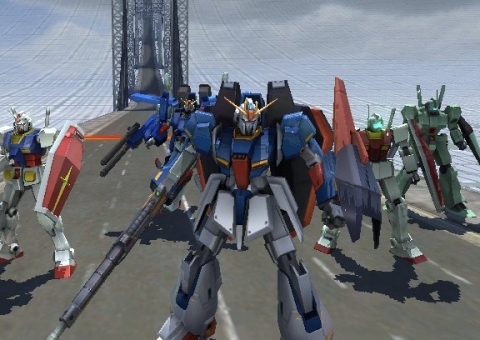 So, while offering a solid gameplay experience, Mobile Suit Gundam: Extreme VS-Force lacks that extra bit of detail that could have come from all of the characters and lore that it sits upon. There’s too much assumed knowledge, and this lets down the missions and the variety of units available. It’s a good game if you’re fully caught up with Gundam lore, but even casual fans might struggle to get along with this one.